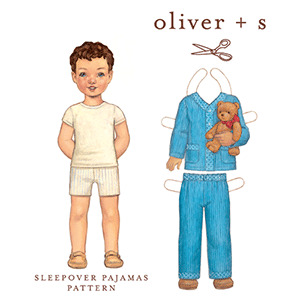 Get out your new pajamas for the sleepover! 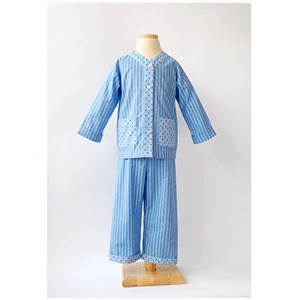 The pattern for this boys' or girls' pajama top, which was inspired by vintage baseball jersey styling, features contrast trim at the outside edge and on the pockets. The cuff at the sleeves can be let down as the child grows. The elastic-waist pull-on pants have no side seam for extra sleeping comfort and include contrast bias trim at the hem that can also be let down as the child grows. 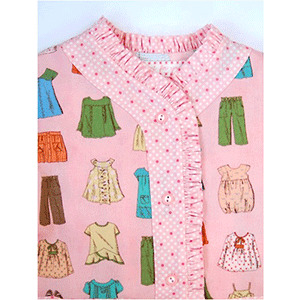 Make the alternate view with ruffles for a sweet girls' version. 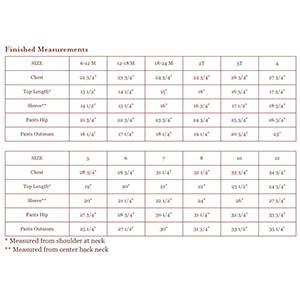 Suggested fabrics are lightweight wovens, broadcloth, lawn, shirting, poplin, voile, and linen.